Picked up on Blu Ray Paul Verhoeven's trashy Showgirls,espionage thriller The Package, William Friedkin's The Sorcerer which I have never seen before and two horrors from the Vestron collection the awesome The Gate and the fun and gory The Return Of The Living Dead 3. Nice pick ups there, Young Warrior..
i recently got that same edition of The Gate too, as well as Vestron's C.H.U.D. II ; Bud The Chud (1989). 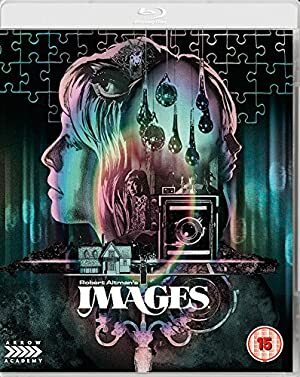 I know it's a pretty lousy film, but hey.. i'm a 80s horror completist, so i couldn't help picking it up ! 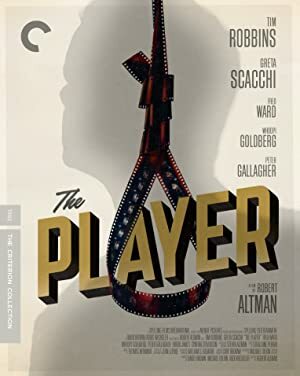 plus added two more Altman films from the Criterion Collection to my collection as well, The Player (1992) and Short Cuts (1993). Never seen C.H.U.D. 2:Bud The Chud but would like to check it out just out of curiosity though I'm not expecting much from it and need to still update my Anchorbay DVD to the U.S Arrow Blu at some point of the original which is a great flick! Picked up a few Blu's mostly horror with the Troll twin pack,The Slayer,The Thing which I already have on Blu Ray but I've doubled dipped as I want the best release of it which I believe this currently is, lastly the Aussie cult Sci-fi Dead End Drive In. I just got this off amazon.com. Wow Jamey V. That's awesome! Some awesome movies amongst that lot Jakey V,I especially love Tuff Turf,Angel,Soul Man,Black Moon Rising and Fraternity Vacation. Reform School Girls is enjoyable as well and though I have seen Night Patrol it was that long ago I couldn't give you an honest opinion on it! The only one I've never seen is Girls Just Want To Have Fun so I'll think I will add that to my rental list to check out at some point! Picked up on Blu Ray Van Damme's Cyborg,comedy Carbon Copy with Denzel Washington and the Cannon Films political thriller The Ambassador with Robert Mitchum,Rock Hudson, Ellen Burstyn and Donald Pleasance. It's been out for quite some time already, but i finally decided to pick this up before it goes out-of-print. 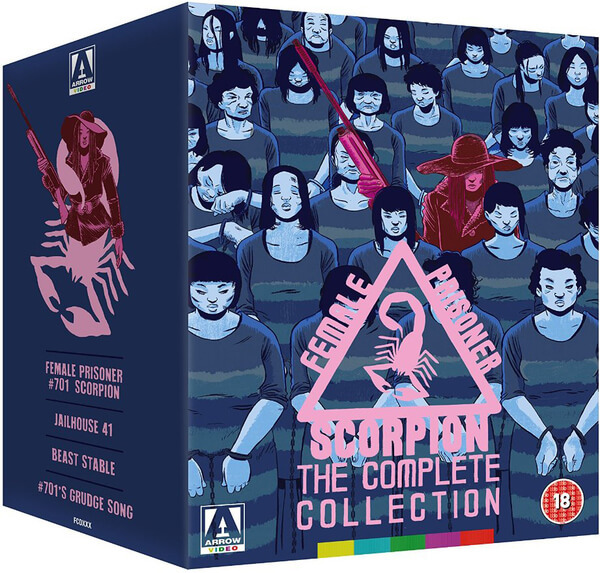 Arrow's box-set of all four original Female Prisoner Scorpion films from the early '70s starring the iconic Meiko Kaji. so i figured this box-set wouldn't be out of place in my own collection ! Picked up on Blu Ray the hilarious 1980 Gene Wilder Richard Pryor comedy Stir Crazy plus the Arrow Blu Ray release of Sho Kosugi's Pray For Death. Also got myself a replacement boxed copy of Ms.Pacman on the Atari 2600 as my old copy had more or less bit the dust! Latest Blu Ray pick ups I got Arrow Video's Dark Blue with Kurt Russell,U.S import of See No Evil Hear No Evil with Gene Wilder and Richard Pryor and lastly the fun action adventure Jake Speed with the late Wayne Crawford, Dennis Christopher,John Hurt and the beautiful Karen Kopins (Once Bitten) also from Arrow Video. Ms. Pacman--excellent! Those Atari folks really knew how to design great games. I love playing the old-school stuff. A Pistol For Ringo / The Return Of Ringo (double feature blu-ray) and The Complete Sartana Collection (5-disc box-set). 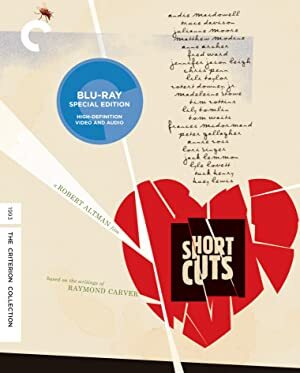 to the new Criterion edition. The first date i ever had with a girl, i was in my early teens, and we went to see Young Einstein at the movie theater. Well, actually i wanted to see A Nightmare On Elm Street 4, but the girl didn't agree with my initial choice.. so Young Einstein it was. Picked up a few lately I got myself the Amityville Horror Blu Ray Steelbook and two movies I've heard numerous good things about over the years but have never got around to viewing and that is Outland with Sean Connery and Body Heat with William Hurt and Kathleen Turner both again on Blu Ray. Italian slasher horror Blade In The Dark,70s Aussie Erotica flick Felicity and fun crimbo horror Better Watch Out. Bit of a mix up so far this last month i got New Jack City on Blu Ray,The Night Before on VHS plus a few Atari 2600 games - Activision's Megamania,Mr Do and Amidar from Parker Brothers. On order I have Shout Factory's Blu Ray of the 1987 ace comedy Three o'clock high so looking forward to that arriving! https://youtu.be/sLXIk8n45AE - Megamania Atari 2600 review. Picked up a Vestron VHS of Sergio Martino's 1988 fight flick The Opponent starring Ernest Borgnine,Daniel Greene and Pierce Brosnan's wife Keely Shayne Smith plus the awesome 1987 comedy Three O'clock High on Blu Ray with Casey Siemaszko,Richard Tyson and with brief appearances throughout by the likes of the great John P. Ryan,Philip Baker Hall and Mitch Pileggi. I picked up Bachelor Party a few days ago at a thrift store. It has a sticker on the side which appears to be from a video rental store. Darn it, I miss renting videos. But I do love streaming too. I'll be saving this for the winter time and try to make it an 80's movie weekend. Bachelor Party is a blast to watch Pittsburghgirl! Picked up on Blu Ray Porky's Revenge and Lamberto Bava's 1985 horror Demons plus on DVD The Strangers:Prey At Night which my wife and I did catch at a late show when it played at the theatres a little while back and had quite a fun time with it and also thanks to fellow rewinder Johnny Roarke who gave me the heads up about its release I grabbed The Final Cut UK DVD release of The Wild Life. 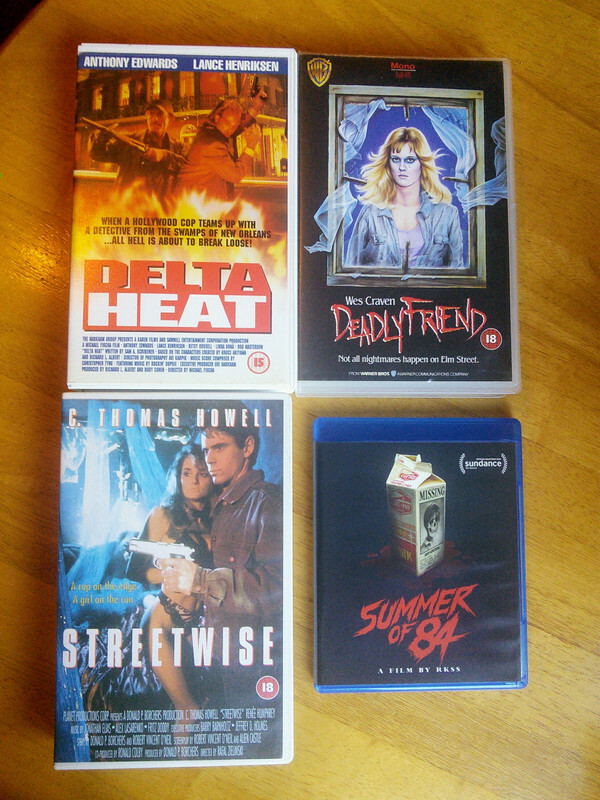 Picked up a few VHS two of which I have never seen before and have yet to be released to DVD /Blu Ray and that is Delta Heat with Anthony Edwards and Lance Henriksen plus Streetwise which is from the makers of 1984's Angel and stars C Thomas Howell. Lastly on VHS I picked up a copy of the awesome 1986 Wes Craven horror Deadly Friend which I do already own on DVD but I do love to revisit some of my old faves on tape from time to time! On Blu Ray (made on demand disc) I grabbed a copy of the 2018 horror Summer Of 84 which has received some really positive reviews! Latest Blu Ray pick ups I got Zone Troopers a goofy but fun 1985 sci-fi flick from Empire Pictures starring Tim Thomerson,Al Pacino court room drama And Justice For All from director Norman Jewison,George A Romero's Monkey Shines and lastly the 1987 comedy Dragnet with Dan Aykroyd and Tom Hanks. I like all of those, even the goofy Zone Troopers. Tim Thomerson was perfectly cast. He's so underrated. To me, no movie with him in it could be all that bad. Yeah I agree Crash I dig him in Zone Troopers plus the original Trancers movie and thought he was also great as one of the helicopter pilots in the awesome Ted Kotcheff flick Uncommon Valour. Makes me think of another cast member from Valour actually Fred Ward who I think never turns in a dud performance and tends to make each feature that more enjoyable! The ones I upgraded to Blu from DVD were the fun Carl Reiner comedy The One And Only with Henry"Fonz"Winkler,Whoopee Boys with Michael O'Keefe,Paul Rodriguez which is pretty idiotic but manages to make me laugh each viewing and Extremities which is a well acted thriller/drama with the late Farah Fawcett. New to my collection is Street Smart with Christopher Reeve which I think is an underatted crime drama lifted by the performance's of both Morgan Freeman and Kathy Baker then lastly a blind buy for me is the comedy Partners which is no laugh riot but there is humour there and with a couple of likeable performance's from Hurt and O'Neal plus it certainly isn't is PC.